You can’t put a price on peace of mind. But, as a home or business owner in the Beach City area, you have the potential to attain that level of serenity by turning your HVAC and comfort needs over to a heating and cooling company you can trust. Clear the Air Cooling & Heating has the residential and commercial HVAC services your space needs to cultivate the comfort you deserve. In fact, from our flawless air conditioning installations to our speedy furnace repairs, our HVAC contractors are focused on making sure that anyone who steps through your door immediately feels at home. It’s a difference in comfort and care you’ll feel—literally. Matt was on time, and did a great job, in and out in less than an hour! Your comfort begins with your HVAC unit—and, with a proper system installation, your comfort won’t end. At Clear the Air, our team has spent years honing and perfecting our HVAC services. With this extensive hands-on experience, performing flawless AC installations and heating installations is no sweat for us. For you, this means four seasons of complete comfort. Our comfort specialists are committed to providing top-notch services for superior results by helping our clients through the entire installation or replacement process. When you bring your AC replacement or furnace installation need to us, we will start by assessing your comfort demands and examining the layout of your Beach City-area property. We’ll use this information to recommend a system that’s a perfect fit for your space—and your budget. From here, we will expertly install your unit and then triple check that it’s working properly before we leave. We don’t take our HVAC company’s commitment to your comfort lightly. This means we won’t leave you high and dry after performing your installation. Instead, from executing heating repairs to delivering AC maintenance, we stick by your side for the life of your unit and beyond. It’s time to kick back in a more comfortable space. The comfort and care you warrant has finally arrived. Your HVAC system works tirelessly to keep you cozy. But over time, the stress your unit endures takes a toll on its wellbeing and can lead to the need for a repair—or worse. So to protect your budget and your comfort from a costly catastrophe, it’s crucial that you address your AC repair or heat pump repair right away. Not only will this stop a small problem from escalating, it will elongate your system’s lifespan and increase your unit’s energy efficiency, too. Clear the Air’s certified technicians work around the clock in the Beach City area to protect your comfort. So if your system malfunctions, you can count on us to show up quickly, diagnose your system’s problem accurately and then perform the speedy, dependable repair your system—and peace of mind—need. 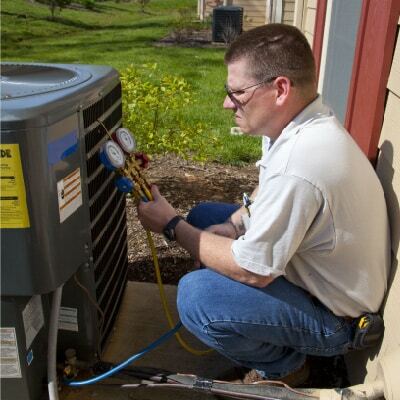 We also offer 24/7 emergency HVAC repairs. There’s a reason why we offer each and every one of our HVAC services. Our maintenance services were designed with your unit’s future in mind. From seasonal system inspections to frequent unit check-ups, our professionals thoroughly clean and inspect your furnace, heat pump or air conditioner from head to toe. If there’s a problem, we will find it—and, most importantly, repair it. This extensive behind-the-scenes look at your unit does more than keep your space comfy. It extends your system’s lifespan, lowers your electricity bills and protects your budget from encountering a disaster, too. Best of all, our team offers HVAC maintenance agreements that make these preventative services (and your peace of mind) more budget-friendly. So, what are you waiting for? It’s time to give your HVAC unit the TLC it needs. The reason why Clear the Air stands out in Beach City’s cluttered HVAC industry is because we stick to our word. We promise to show up when we say we will, keep your comfort as our priority, provide only high-quality air conditioning, heating and IAQ products and services, and never tell you one price over the phone and then bill you for “extra” hours later. In short, our Upfront Pricing Policy leaves no room for surprise repair costs later on. We make this promise to you because our team actually cares about you, your comfort and your budget needs. But that’s not all. Not only do our HVAC contractors hold unparalleled industry expertise, but they are passionate about their profession, too. This means you can count on the services our technicians deliver because they are committed to your satisfaction and because they actually enjoy what they do. Superior service with a smile—now that’s the service you truly deserve. Why do Beach City residents love Clear the Air? Well, from our dependable installations to our efficient repairs to our thorough maintenance check-ups, our services leave new and aging HVAC units working to perfection—all year long. Call us at 281-612-1031 today! Your more comfortable space is waiting. Our NATE-certified technicians can help with any repairs or assist your in finding the right unit for home or office.